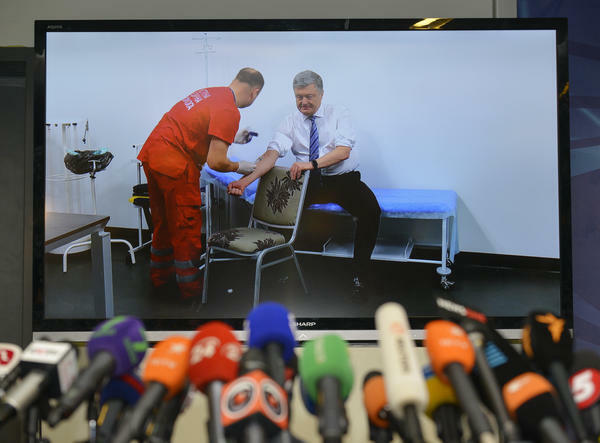 Ukrainian presidential candidate Petro Poroshenko takes a televised blood test. Ukraine's presidential election – which was already high-drama — has taken an unusual turn. The two remaining candidates took highly public alcohol and drug tests on Friday, as part of an escalating series of challenges delivered on social media. The runoff election on April 21 pits incumbent President Petro Poroshenko against Volodymyr Zelenskiy, a comedian who plays a president on TV. Zelenskiy came out of the first round of election with 30 percent of the vote – nearly double the number of votes cast for Poroshenko. "I took a blood test. They pumped all sorts of blood out of me. But thank God, I have enough of it. Young blood," Zelenskiy told reporters, as Reuters reported. The incumbent leader has been pushing his rival, who has no political experience, to participate in a public debate. Zelenskiy had the issued the drug test demand to Poroshenko after he accepted Poroshenko's challenge to debate, as Reuters reported. And he further upped the stakes – in a slickly produced video, the comedian strode in slow motion onto the field of Ukraine's largest sports arena, Kiev Olimpiyskiy Stadium. "The debate will take place before the Ukrainian people," he said, challenging the leader to take him on at the stadium, not a TV studio. "I give you 24 hours. Think," the comedian added, according to a BBC translation. It's a challenge that Poroshenko accepted in his own video, though he criticized the "uncertainty" involved. "This is no joke. Being president and commander-in-chief is not a game," he said. On Friday, Poroshenko took his drug test at the stadium. "Poroshenko challenged Zelenskiy to take the test at the sports arena along with him, but Zelenskiy said he doesn't trust that lab and took his test at another one," The Associated Press reported. In a tweet after he had blood drawn, Poroshenko said he thinks these tests should be required, "because the question of absence of addictions to alcohol and drugs in a candidate for President – is a question of national security." According to the Interfax Ukraine news agency, narcotics were not found in either candidate's blood. In the first round of the elections, former Ukrainian Prime Minister Yulia Tymoshenko came in third place. Zelenskiy requested that she moderate their debate, which Poroshenko roundly rejected. "Debates are not a show. I believe that such disparaging and frivolous treatment is disrespect for the politician, Yulia Tymoshenko," the incumbent added, according to Interfax Ukraine. Ukrainian presidential candidate Volodymyr Zelenskiy, who led the first round of presidential polls, took a blood test in a private clinic in Kiev on Friday. "This 'stadium debate' affair may turn out to be simply a disastrous episode on Mr Zelensky's path to the presidency." Throughout the campaign, the actor has appeared to draw support from a large cross section of the population. Zelenskiy adviser Dmytro Razumkov recently told NPR's Lucian Kim that he, "already popular among young people, has widened his electoral base to include older generations and has evenly balanced support among Ukrainian- and Russian-speaking voters." His appeal, Kim reports, "doesn't lie in any specifics of his platform but in the mere fact that he is a fresh face with no political baggage from the past." Poroshenko was elected in 2014 vowing to fight corruption, but Kim adds that goal is "still out of reach." A major issue in this electoral race is the country's relationship with Russia, which annexed the area of Crimea from Ukraine in 2014. As Kim notes, Poroshenko's campaign is pushing the idea that "he is the only candidate who can stand up to Russian President Vladimir Putin." And, he's hoping to have multiple debates to make his case. As Interfax Ukraine reports, Poroshenko's campaign is arguing that there should be two rounds of debates – one in a stadium, and one in a TV studio.